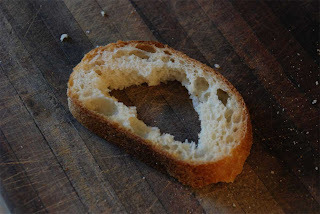 How the little ones eat bread. When I was a Little One I used to eat only the crust. Like Jack Sprat and his wife, the Little Ones and I could have licked the plate clean between us. PS We saw Santa in his grotto yesterday. He has reassured The Children in the matter of The Escapologist Hamster. Much relief. you could have licked the plate clean, but the little ones tend not to get a plate. No, no, I don't think we should abandon the plan. Anyone who's prepared to eat the crust after the little ones have had it is welcome to it. And who needs a plate when you can walk around with the food leaving a trail of crumbs through the place to show where you have been.